"Wrong way, Wrong Way!" A cry often heard by Guardians in the middle of a battle. Wrong Way is as friendly as most Guardians, but his sense of direction leaves much to be desired. Often times he takes off in the exact opposite direction of his intended destination, whether he's supposed to be advancing or retreating from the enemy. Still, he seems good natured about his confusion and is still somewhat of a skilled fighter, which can surprise his Renegade opponents. A repackaged import of the Machine Robo Apache Robo toy, Wrong Way converts from robot to AH-64 Apache helicopter. The rocket pods for the copter are detachable for some versions of the toy, but not on others. 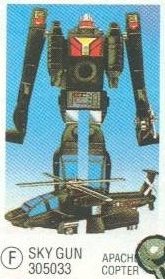 The fifth toy from the fourth wave of figures, Apache Copter Man was released by Bandai Australia in 1984. While identical in design to the original Apache Robo toy, he received a deco based on the figure's prototype; olive green with dark blue canopy and black visor. Apache Copter Man was packaged on a blue backing card. Later in 1984, the figure was re-released with his GoBots name and faction on a new black backing card depicting a yellow-tinted alien landscape. A running change in 1985 saw the figure replaced with its black variant. 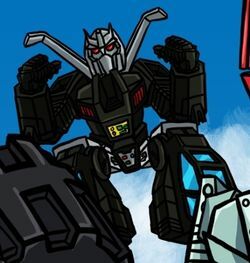 Wrong Way's Cybertronian-style body from the "Cataclysm universe" is modeled on Spinister from the Generation 1 toyline. This page was last edited on 28 April 2018, at 23:08.